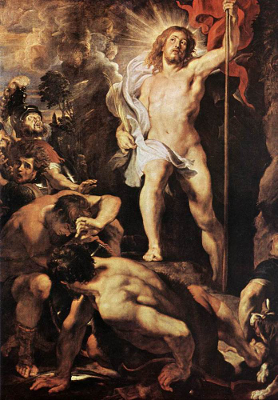 I am very pleased to find here this wonderful work that is one of Rubens’ main paintings in Our Lady’s Cathedral, Antwerp (my hometown). Together with the two side panels, it encodes for Sunday, April 5, 33 AD, as the date of the Resurrection. Here’s wishing Jos and the rest of the crowd a Happy Easter. Don’t you just love the subtle flick of linen protecting His modesty. And despite the date of 1611, there’s no loin-cloth. Charles, please note!